Gold pass holders have full access to the standard 2D CAD Blocks, the professional Color CAD Symbols as well as CAD Drawings sections on the website. Our color blocks are unique and nowhere else to be found on the web. 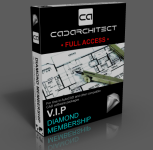 Platinum pass holders have access to a vast database of CAD files and various other information. Users get access to all CAD Details, Building templates as well as the contracts & documents as used typically in the industry. Diamond pass holders are the VIPs of this website and have FULL ACCESS to all that this website has to offer. We constantly endeavor to make this section a very exclusive information haven with a wealth of tools, documents and CAD drawings. Can I upgrade my existing CAD Architect pass? Please note that the various CAD-Architect passes provide users access to different CAD categories. The Gold & Platinum passes are not upgrades to each other, but rather gives a user access to different download areas. Unfortunately, our system does not have an ‘upgrade’ function. To upgrade from Gold / Platinum to the VIP Diamond Pass, you will have to purchase a new license, and then the lesser pass will be refunded.